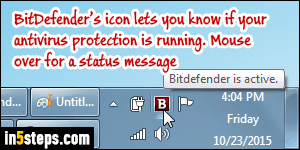 To disable either protection, click on the Bitdefender logo / icon in the system tray ("notification area"), next to the clock. If you don't see the icon, click on the up-arrow button to reveal hidden icons. 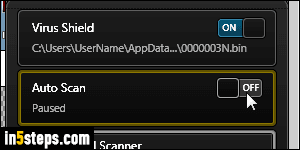 If you plan on keeping Bitdefender, you should set its icon to be always visible, since it uses it to let you know about problems, like disabled antivirus protection until you login to register it! Whether it's disabled or expired, it will show a red on black icon (inverted colors). Once you clicked on Bitdefender's icon, you'll see a panel pop up from the side of the screen: it includes two toggle switches, both of which are "on" (blue) by default. Depending on your User Account Control settings, you will probably have to enter a Windows administrator's password to turn off Bitdefender: turning it back on, however, doesn't require any special permissions. 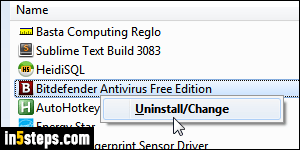 This is good, because it prevents you from accidentally switching off your antivirus! If you no longer want to use Bitdefender Free on your system, you can uninstall it like any other program: Microsoft's own antivirus software, Windows Defender or Microsoft Security Essentials -the same product has different names, depending on your version of Windows- will automatically take over. This assumes that you have installed MSE, in case you are running Windows 7. Windows Defender comes bundled with Windows 8 and Windows 10. Never use a computer without antivirus, especially if it connects to the internet! 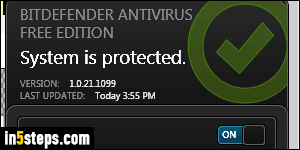 Bonus Tip: having an up-to-date antivirus solution on your computer is a must, as is having a firewall (you can manually enable or disable Windows' firewall, but it's enabled by default). 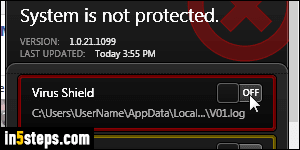 If you didn't get a password prompt to turn off Bitdefender, it could be that you are running as an administrator: this is very dangerous, since a virus that infects you automatically has the same privileges as you do! You should change your account type to a "standard user".